As our cities become clones of other cities with similar looking sky-scrappers and malls, some times during our travels we look for "authentic experiences". This photo-essay is the first part of brief stories about the influences of a globalizing world on cultures. I feel that increasingly, we are making people a part of a "theme-park" experience, rather than engaging with them. The image above introduces some of the ideas that came to my mind when I started thinking about this subject. This picture was taken at Dilli Haat in Delhi (India), an "artificial village market" in the city. There you find city persons and tourists looking at the shops. And then you have crafts-persons from different parts of India who come here to exhibit and sell their work. You also have some persons who serve or entertain the visitors. Like those in the picture above, who wear "traditional" dresses and play "traditional" instruments. They are acting a part that may not be completely false - those turbans, dresses, drums and been (the wind-instrument played by the "snake charmer"), may also be part of their "real" lives. These are only jazzed up with colours and accessories that highlight their exoticness. Thus, Dilli Haat gives you an artificial "authentic" experience, in which make-believe and reality are mixed and stirred together. 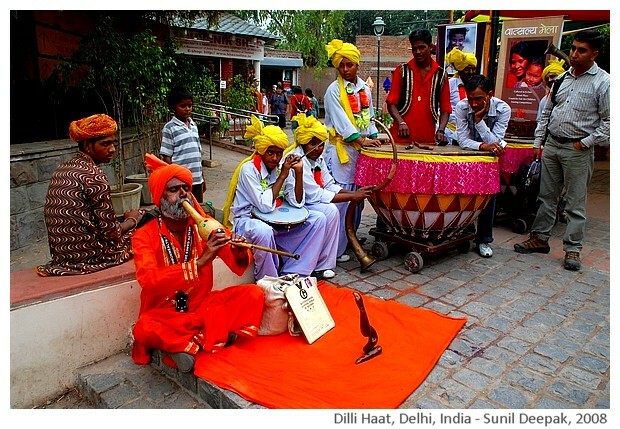 The aim of Dilli Haat is noble - to provide a market for humble crafts-persons. It markets this aim by making it a "village theme park" experience. This is the area that I am exploring in this post by referring to some of my travel experiences about changing traditions and our search for our roots. I do not wish to give value judgements about this in terms of right or wrong. Rather, it is just a way of looking back at few episodes from my travels around the world. And I want to start this reflection with a travel experience from China in 2007. I went to Yunnan province in south-west part of China for the first time in 1989. At that time, Kunming, the capital of Yunnan, was a typical small provincial town with old houses, narrow streets and chaotic traffic, full of horse and cattle driven carriages. I don't remember seeing any tourists during that travel. The last time when I was in Kunming in 2010, I was staying in a hotel room on the 24th floor in a city that seemed to have been made completely new. The roads were wide, the traffic smooth, the houses new. My friends had taken me around on a nostalgia trip to show me some of the old offices - the only problem was that those old places did not look like anything in my memories. During 1960-80s, the national government in China frowned on any showing off of differences and traditions by the ethnic minorities. Thus, minority ethnic groups were supposed to dress and speak exactly like other Chinese. During the years of Mao's cultural revolution, often their traditional dresses, music instruments, temples, sculptures, etc. were taken away and destroyed. 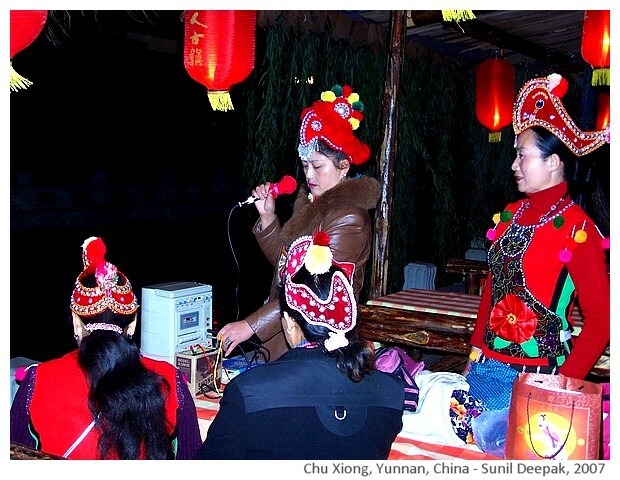 During the 1990s, as China opened and its economy took off, slowly minority ethnic groups regained the freedom to express their specific cultures and traditions. To boost tourism, and probably to fill the void created by cultureless sameness, people were being dressed in ethnic costumes to add colours and folklore to places and events. Many of the old temples were reopened and their some times, their sculptures were found and replaced. With this background information, now let me move to some of my experiences about traditions, changing cultures and authenticity, from that 2007 journey when, I had visited different small towns and many "minority areas". 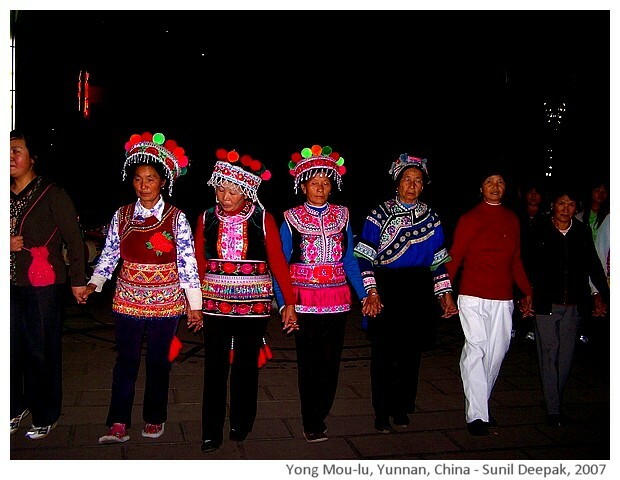 Yunnan is home to a big number of minority ethnic groups. 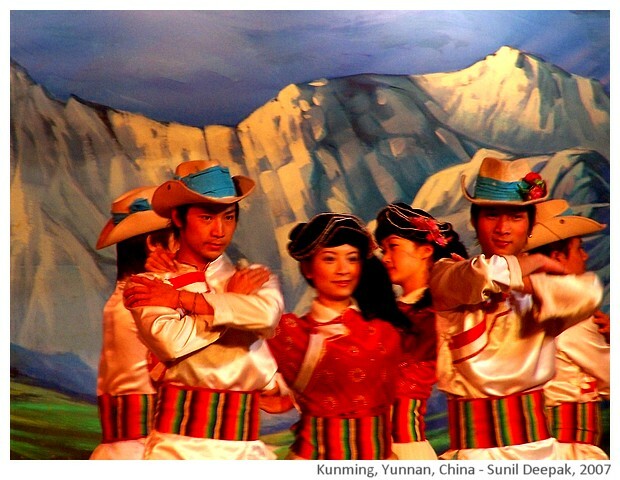 The next two images are from a restaurant in Kunming, where while you eat, there is a show of ethnic dances. 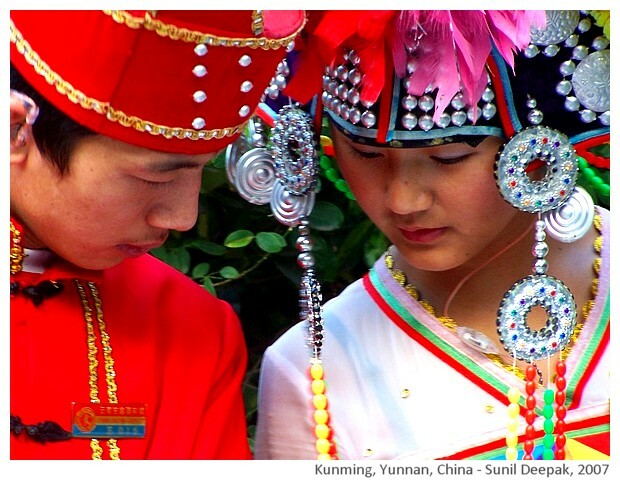 This first image is of two young persons who were wearing traditional ethnic minority dresses and were standing outside the restaurant to attract tourists and to welcome the guests. Often, persons wearing exotic dresses are used in this way in tourist places all over the world to attract and invite tourists. 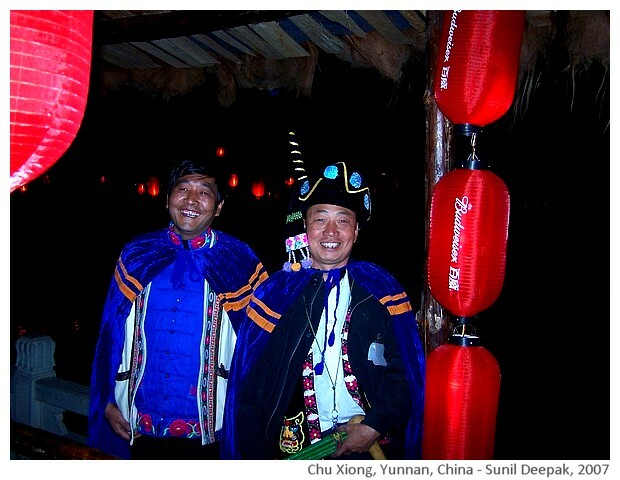 However, over the years, my impression in Yunnan has been that these persons seem to have become more self-confident. Probably for many of them this is a temporary work, and most of them are studying or working for better careers. I think that most of them continue to have their roots in their original clans/groups in their villages. However, increasingly they are not wearing such exotic looking dresses in their daily lives, except for some special occasions. Thus, the image they present is for tourists and not the authentic representation of their lives in their ethnic groups. The next picture is from one of the dances inside that restaurant. This dance had guys wearing cowboy hats from the American western movies. Wearing cowboy hats is another sign of jazzing up the exoticness for tourists (mostly Chinese tourists). They are not worried about actual representation of traditions. Thus, new "traditions" may be made all the time. With time, I think that some such new "traditions" can grow roots and become more widespread in their communities. 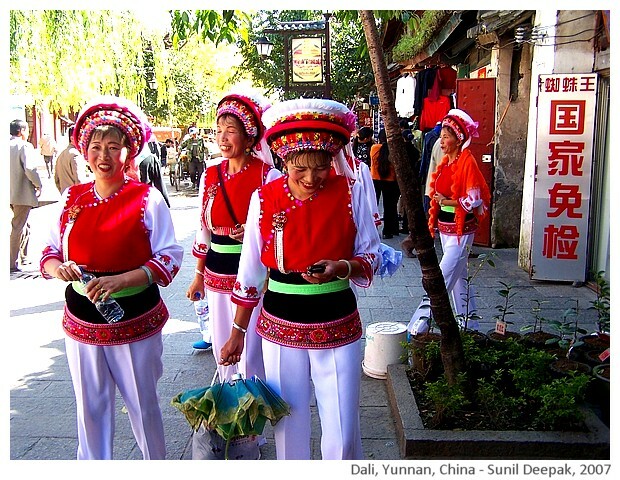 The next image is from Dali, one of the minority ethnic area, not very far from the Chinese border with India. These women working at a souvenir shop, were going out for their lunch break. They were wearing their full traditional jackets and caps like a uniform, all in the same colours.Only the top part of their dresses was traditional, below they had the practical looking pants. The next image is from Li-Jiang, not very far from Dali. In late 1990s, Li Jiang had a bad earthquake and the old part of the city was destroyed. During the reconstruction of the old city, an artificial Li-Jiang was built - a theme park, with restaurants, discotheques, souvenir and handicrafts shops for tourists. 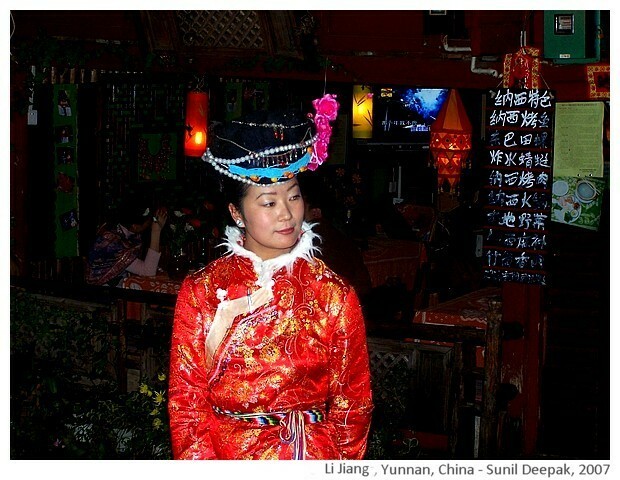 In this Li-Jiang, the local people dressed up in their ethnic dresses and made it an exotic tourist experience. In Li Jiang, the impression of real-meets-artificial is very strong and their boundaries are completely blurred. Late one night, we reached the city of Xu Chiong. I had visited it earlier in 1996. The doctor who had been my guide and had accompanied me at that time was now the governor of the city. He had treated me like some visiting royalty! Like Kunming, Xu Chiong had also become unrecognizable - it seemed to be a brand new city made from scratch. There was a huge square in front of the hotel. On my first night, from the window of my room, I saw a group of people playing traditional music and dancing in that square. Though I was very tired, I was very curious. So I went down to take a closer look at them. This was not a show for tourists. Their dresses were very different and some people had no traditional costumes. They were not young persons, usually chosen for tourist shows. There was lot of clapping, shouting and some loud singing. Clearly they were having fun. I tried to ask questions through the gestures-language to find out if it was some traditional festival, but they did not understand me. But they were very welcoming and I joined them and learned the simple steps of their dance. It was an exhilarating experience. The next two images are from that evening. When I think of that evening, I feel that this was an authentic experience - of real people, rediscovering and celebrating something that they had lost. 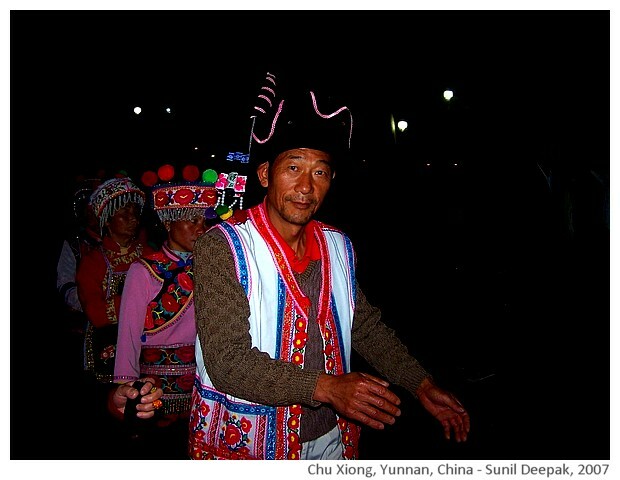 However, Chu Xiong was also the place where I had another surreal experience in terms of ethnic minority traditions. Near the periphery of the city, a Li-Jiang like new tourist centre had been created, with designer tribal houses, Venice like canals, lights, shops and restaurants. One evening, the governor took me there for dinner. It was kitsch, gaudy, fun and completely artificial. There I came across some persons who had rented traditional dresses and had portable microphones. Men and women were sitting on the two sides of a Venetian canal, and were singing traditional tribal songs about persons pining for their beloveds, separated from them by a mighty river. When I asked, I was told that they were enacting an old tribal tragic love-story that was famous in that area. In that story, the boy from another village, sang songs for his beloved from the other side of a river. These persons had probably grown up listening to that story and were rediscovering that tradition in an "artificial" or make-believe version. The were having a lot of fun and could not stop laughing. The whole episode left me feeling a little dizzy in terms of its meanings of traditions and authenticity! 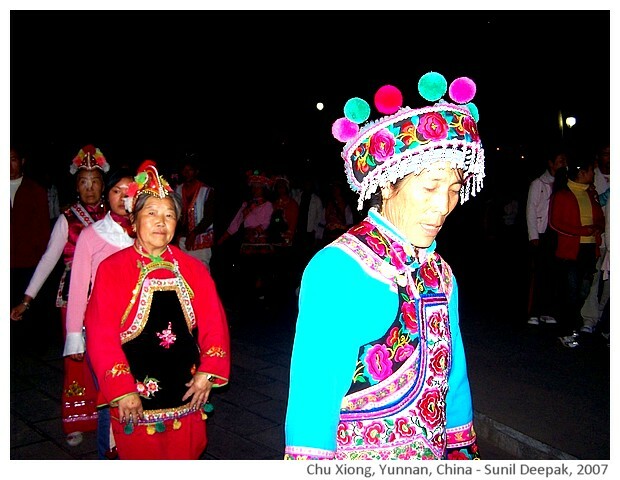 In another small town called Yong Mou-lu near the border with Vietnam, one night, I found another group of ethnic minority persons, dancing for themselves in a small dark city square. 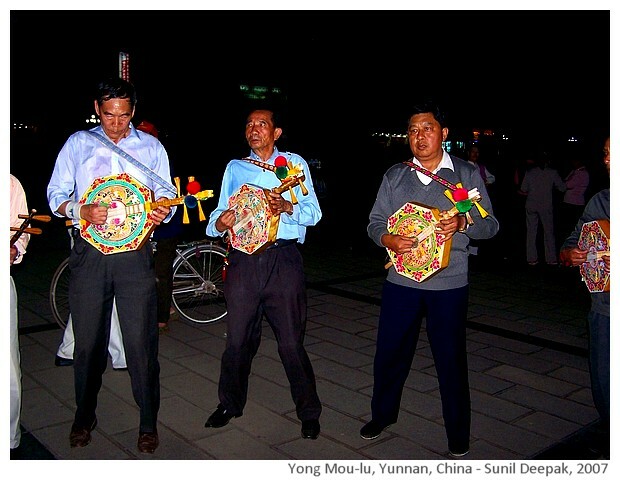 The men had their old traditional music instruments and they knew how to play them. This time, I had translator with me, who helped me to talk to them. They had managed to hide those instruments and saved them from the destruction of cultural revolution. Hidden away, somehow they had also managed to keep their skills of playing those instruments. So then, how do we define authenticity and traditions? 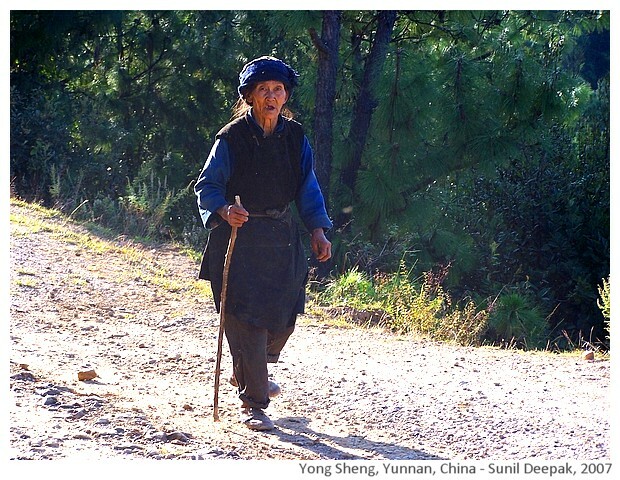 Actual tribals living in a remote mountain village, like the lady in the picture below, did not have the jewellery and the costume worn by persons who play tribals in the tourist centres. She is authentic. As a tourist, if you are travelling, would you really want to visit these places where you will not have services and comforts, and people are not wearing exotic colourful costumes? 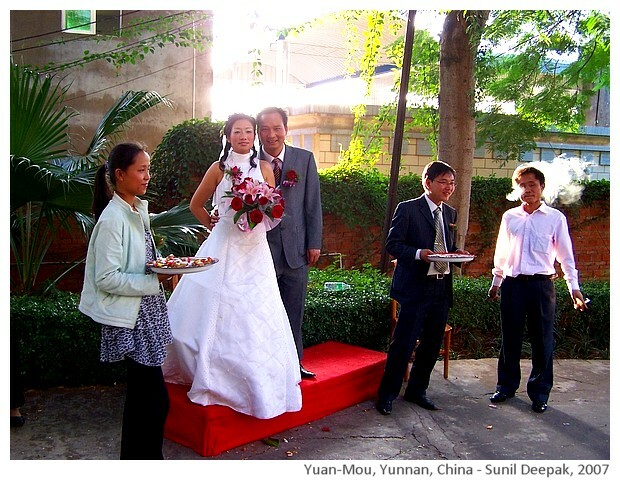 The last image from the 2007 Yunnan visit is of a newly married couple in Yuan Mou-Lu. Except in the remote villages in the mountains, almost all the young people in China today get married in very Western looking dresses and ceremonies. Wearing traditional ethnic dresses for the marriage is looked down at. While looking at them, I felt a little sad that they had lost those traditions. Yet, at the same time, not knowing the language and thus unable to communicate with them, I also felt that some of their traditions may still be alive today, in new forms, especially in their songs and dances. Today the traditions and cultures are changing faster and at a bigger scale. The changes in the past were rare and slow because interactions with outsiders were few. Now the contexts around us and the historical events force us in different directions. I think that some of the ethnic minority groups that I had met in south Yunnan, would also have parts of their clans in India and Vietnam across the borders. It could be interesting to look at those clans to see how they have changed in other contexts. In these reflections, my focus was more on clothes and dances. Languages, customs, rites, religions can be other areas to look at, if we wish to think of traditions and authenticity!